FlowForma is revolutionizing the Business Process Management (BPM) market by providing inexpensive and easy to adopt Digital Process Automation (DPA) tools that help organizations transition quicker to Digital Transformation. Forrester Research Inc’s, recent report “Traditional BPM Gives Way to Digital Process Automation”, states that within the next two years, the primary goal for business process management (BPM) projects will be to drive digital transformation initiatives. This is a stark change from just two years ago, when application development and delivery professionals considered the primary goal to be cost reduction. Traditional BPM projects — long, hard, expensive, and resource-intensive — paid off with cost reduction. Now companies cite digital transformation as the BPM investments. Strategic initiatives such as digital transformation is required to support cross functional teams with technology, to enable efficient collaboration in a secure and mobile way across different departments and geographies. The path to digital transformation goes through user experience. The closer users get to the processes, the faster and more efficient they become - increasing user satisfaction. An award-winning Office 365 App, FlowForma® enables business users to deploy processes with speed and flexibility, no matter what the complexity. A proven no-code, logic only approach enables business users and Heads of Departments to quickly implement processes such as HR on-boarding, new product development and clinical trials. FlowForma is designed to be configured by the people who understand your business need. Business consultants, power users, business analysts are all examples of people who use our Flow Designer tool to quickly create complete solutions on the SharePoint platform. This allows the IT department to manage and monitor processes centrally. The FlowForma Cloud tool incorporates forms, workflow, document generation and decision making all in one place. FlowForma's CWM (Collaborative Workplace Management) gives organizations the ability to collaborate on project work and strategic initiatives in a central area. These projects/processes are designed and built in the process owners area, along with the security of the processes and their data also residing within the process owners’ area. When we have processes that extend out of a single division/business unit (like innovation), a CWM area can be created, and a virtual team become the users of those processes. “Release 6.0 give users the ability to group their processes into dashboards that can give you trend analysis on processes. You can also access your groups work item queues, see which processes in a process group are assigned to a user and what stage they are at. Of course, just like FlowForma DPA, CWM can be configured without any code. You just need an understanding of the business challenge and your human resources,” said Luke Kennedy, Chief Technical Officer, FlowForma. 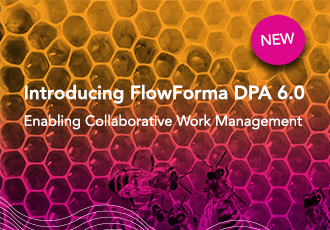 FlowForma’s Collaborative Work Management (CWM) Add On provides organizations with additional features and functionality to enable cross functional teams to collaborate on strategic initiatives in a secure, collaborative and mobile way. Virtual teams of disparate resources can be associated with programs of work (initiatives/ projects), where each program contains many processes, which may be owned by multiple process owners across the business. CWM provides a macro view, that aggregates all activity related to a program of work, regardless of where the work is carried out. It shows the user a personalized view; so that an individual resource associated with a program can see queues of work specifically related to them, against a dashboard of all program activity. To learn more about FlowForma's CWM add-on view our short demo video, download our product brochure, or why not talk to one of our product experts on how CWM can impact your organization.